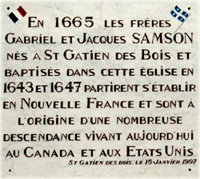 "In 1665 the brothers Gabriel and Jacques Samson, born at St. Gatien des Bois and baptized in this church in 1643 and 1647, left to settle in New France, and are the ancestors of numerous descendants living today in Canada and the United States"
The two Samson brothers, at only 22 and 18 years of age, left their home in Normandy, France to settle in the New World. Gabriel and Jacques Samson were bom in St. Gatien-des-Bois, France, and established homes side by side in Pointe de Levis, Quebec, Canada. Twenty seven children were born to the two original settlers, including Gabriel Jr., who started the Acadian branch of the family. This homepage traces the descendants of Gabriel and Jacques; the Samsons (and Sampsons) of North America, and provides a means of sharing genealogical and historical information. 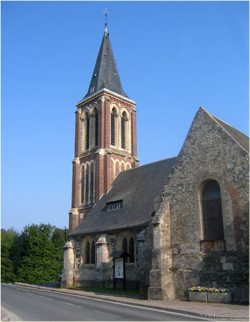 Much of the information contained on this web site has been supplied by direct descendants of Gabriel and Jacques. The generosity of information has helped numerous other Samson descendants trace their roots. Please consider making information on your branch of the tree available to others who may be searching, by contacting me. All personal information (such as birth, marriage, death dates) occurring within the past 100 years will be kept strictly confidential. My original goal when I began my research was to fill in some family ancestral charts. Over the years, I gathered a large amount of historical and genealogical information on the Samson family, and wanted to make it available to other Sam(p)son descendants. With that in mind, I created this website in 1999, and have enjoyed communicating with Samsons from all over North America, and other parts of the world. I am a descendant of the Acadian line. My father was born on Isle Madame, Nova Scotia, a remote area of French Acadian settlers, the son of a fisherman. His ancestors had been fishing off the island for over seven generations, but he decided to pursue a career in medicine. After residing in Nova Scotia and Ontario, he moved to Cajun Louisiana, where many residents speak in the same French accent that they do on Isle Madame (“Cajun” comes from the word “Acadian”). Although separated for over 200 years, the two cultures remain very similar. I reside in Los Angeles, California, and work as an architect designing custom homes and additions and renovations, although genealogy is a hobby. I have always had an interest in history and a curiosity about my Acadian ancestry. We have a rich and fascinating heritage that should be recorded and made available for future generations. The Irish philosopher, Edmund Burk once remarked: “People will not look forward to posterity, who never look backward to their ancestors”. I hope you will enjoy reading these family histories as much as I have enjoyed putting them together. In genealogical research, one of the most important aspects is thorough documentation of all sources. This is critical because some sources are more reliable than others, and one may forget later on where they came across a specific piece of information. You may copy the information below for personal use only, however, please note that your source was www.samsonhistory.com, by Charles A. Samson. While compiling my data, I have relied on the assistance and contributions of several people whom I would like to acknowledge. My sincere thanks to the following individuals: Stephen White, genealogist at the University of Moncton, “Centre d'Etudes Acadiennes”, for providing most of the Acadian Samson genealogy and biographies. Marcel Samson, Roger Samson and others for preparing their document “Familles Samson, Tricentenaire Au Canada”, about the Quebec Samsons, in July 1967. George Sampson of West Newton and Gilbert Samson of Levis for providing information on the early Samson history and many of the lineages of the Samson family. Al Samson, Madeleine Samson and Kim Richards for providing photos of St. Gatien-des-Bois; and Alan Samson of Halifax for providing copies of original documents. Also, Jeanne Joyce-Stone for creating my original Samson webpage, and Robert Samson for modernizing and updating it. Lastly, I would like to thank all of the members of the Isle Madame Listserve who have added so much information on the extended families of the Acadian Samsons.